Recent graduates of the On Being a Spiritual Nurturer program have recently had articles published in Friends Journal. In the October 2011 issue there are two articles by Ashley Wilcox and in the February 2012 issue, Bruce Neumann writes of his experience with Quaker Communion during the last class of the program. The Way of Ministry graduates Noah Baker Merrill and Janet Hough are the planning committee for this year's Quaker Spring. This will take place at the Stillwater Meetinghouse in Barnesville, Ohio, June 24-29. God is now gathering the next class of the program On Being a Spiritual Nurturer. We invite you to take this journey of faith with us. In recent Testing the Waters retreats in Richmond, Boston and Philadelphia, we asked, "Do you have a yearning for God?" "Do you wish to journey with others who are similarly called to a more intentional life?" "Do you wish to make this journey within the faith and practice of Friends?" Each person is asked to listen to their responses to these questions. We simply make the invitation, knowing of God's persistent and insistent call. Our invitation may be both enticing and challenging. Enticing because we each wish to be known as a beloved child of God; challenging because we may be changed by the experience. God's invitation is ever-present. How faithful is our response? A final Testing the Waters retreat will be held at Red Cedar Friends, in Lansing, MI, at the end of April. Come and learn more about the program. Patty, Beckey, and I would love to see you there. If you cannot be there, then be sure to contact us about your interest. And now a new opportunity is available from the School of the Spirit Ministry. Accompanying the announcement of A Silent Retreat in the Manner of Friends in Cincinnati, OH, this coming September, we offer a Mentoring Program for those who are called to invite others to remember their relationship with God through the ministry of retreat facilitation. If you feel called to this kind of ministry, please apply or contact us with your questions. Finally, I am deeply thankful for all who contributed to making our recent Abundant Gifts Call for Support a success. We are all humbled by the gifts you have entrusted us with. This has been my experience as I attempt to conceptualize the ways I can impart my Iona experiences and move forward actualizing the learning into shareable actions. Then, I will see where I am next led. Iona is a small island (3 miles by 1 mile) in the Inner Hebrides Islands off the west coast of Scotland. It is a remote, bare, stark, pristine, challenging place with a very small population of year round residents and a large population of sheep and sea birds. It is bone chillingly beautiful from the dramatic ocean and rock formations to the little, brilliant and sweet wild flowers. Unquestionably the center of island life is the Abbey (see photo at the head of this newsletter), founded in the 6th century by Saint Columba, an Irish monk who was exiled from his homeland as a penance. The legend is that he and 14 fellow monks washed up on the south shore of Iona and proceeded to establish a community dedicated to deep spiritual practice, advancing Christian theology throughout Northern Europe and providing radical hospitality in an inhospitable environment. The Abbey has withstood centuries of turmoil, both man made and nature inflicted, but has emerged as a destination for spiritual pilgrims of all different persuasions. It is known to be a place of great serenity and great disturbance; and a place where the veil between the natural worlds and that of the spirit is dynamically thin. Within the Abbey community, there is a strong commitment to peace and justice. The Abbey and the entire island has become a place of prayer, meditation, insight, transformation, encounter, healing (but not the Lourdes or Fatima type), and deep respite for spiritual seekers. 5. The power and awe of beauty. 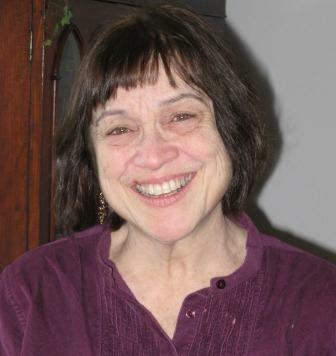 Marybeth Toomey is a graduate of the sixth class of the On Being a Spiritual Nurturer program. 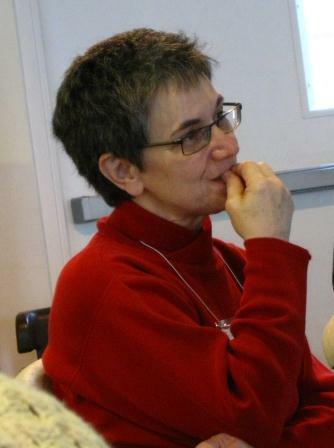 She is a member of Wellesley Monthly Meeting, New England Yearly Meeting. She recently helped host a Testing the Waters Retreat at the meetinghouse. September 27-30, 2012, Linda Chidsey and Carolyn Moon will lead A Silent Retreat in the Manner of Friends at the Transfiguration Spirituality Center in Cincinnati, OH. This may not be a pilgrimage as far as Iona, yet it is a journey west for this ministry. It is not the only journey in faithfulness. Accompanying this retreat is the new opportunity for one or two Friends to be mentored by Linda and Carolyn in the ministry of retreat facilitation. 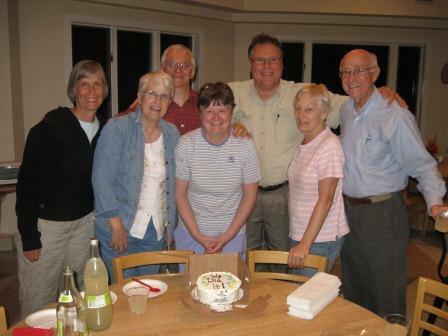 Since the late 1980s, SotS has had under its care a program of silent and contemplative retreats. In recent years, it has co-sponsored silent retreats at Powell House twice annually and last September held a silent retreat in Philadelphia. In responding to a vision to expand silent retreat offerings, SotS currently seeks Friends who have a call to a silent retreat ministry. These Friends will initially be mentored by Linda and Carolyn. Friends may be called to serve as ministers and/or elders at these retreats, and we are open to a pair of Friends who have already discovered the complementary gifts of ministering and eldering. The silent retreats we offer are not exclusively silent. Rather, through solitary prayer and corporate worship, retreatants are invited into an expectant silence out of which words and images emerge. So while these retreats are largely in silence, including at all meals, there are designated times when the group is led in the devotional reading of scripture, where reflection on that reading is invited, and other times when there are opportunities for spiritual reflection in small groups. Learn more about the retreat and about the Mentoring Program on our website. On December 31, 2011, we closed our first-ever fundraising campaign Abundant Gifts. We surpassed our $250,000 goal and raised $266,342. We are humbled by such generosity. We are also grateful for the ministry of listening one to another along the way. The joy of the face-to-face visits filled our hearts. Three-quarters of the funds received came in gifts and pledges from individual Friends and families. One-quarter came as grants from the Legacy Granting Group of Philadelphia Yearly Meeting, the Tyson Memorial Fund, the Shoemaker Fund, and the Obadiah Brown Memorial Fund. We are thankful to all. 1. Scholarships, e.g. for the recent Silent Retreat in Philadelphia and for increased assistance for the next class of On Being a Spiritual Nurturer. 2. New Programs, e.g. the Mentoring Program accompanying the Silent Retreat in Cincinnati. 3. Nurturing the SotS Community, e.g. the Spiritual Renewal Retreat last November and creating the new website. 4. Support of Current Programs. My experience in the Spiritual Nurturer program has been so important to me. It nurtured me as I came to know God's love more deeply. It helped me grow into living more single-heartedly in my family, in Richmond Friends Meeting and in my work as a physician. I was surprised at the invitation to join the board and yet knew that I had been led to this opportunity to continue in the School of the Spirit. Your contribution will help us deliver our programs and provide them to Friends from all economic levels. Please DONATE ONLINE or write your check to Philadelphia Yearly Meeting, earmarked for the School of the Spirit, and mail to the address below. Many thanks!